ENHANCE YOUR LIFE WITH PLANTS!! TROPICAL PLANTS ARE MORE THAN JUST DECORATIVE ACCENTS IN OUR HOME OR OFFICE! Houseplants are correctly being labeled as CLEAN AIR MACHINES. Have you ever considered going indoors to “get a breath of fresh air?” It’s not as crazy as it sounds, considering the level of air pollution we experience daily from automobile engines, factories, asphalt plants, and pesticide use. 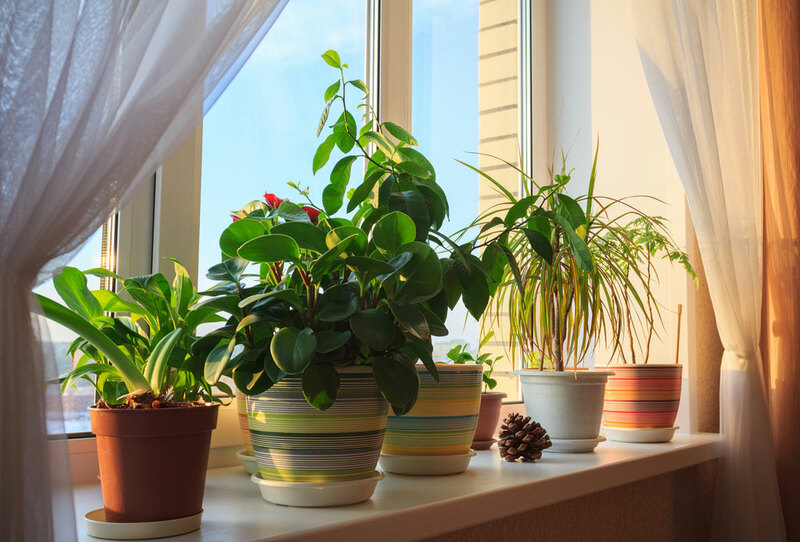 A few well-placed houseplants can make your indoor air safer to breathe. Houseplants, or tropical foliage plants, are more than just decorative accents. NASA research has shown that tropical plants “scrub” the air, removing toxins commonly found in homes and office buildings. Volatile organic compounds ( VOC’S) known to cause allergic reactions, and even cancer or other serious health problems, have been found by EPA inside newer energy-efficient buildings. New building methods and products have led to what is called “sick building syndrome”, where vapors from toxic chemicals such as benzene, formaldehyde, and trichloroethylene are trapped inside causing some people to experience headaches, asthma, and other allergy symptoms. Studies are still being made to determine if long-term exposure to these VOC’s can contribute to increased incidences of cancer. In addition to these chemicals, carbon monoxide and “bioeffluents” (gases produced during human respiration) are also sources of indoor pollution. Ninety percent of people spend nearly 22 hours a day inside without enough sunlight or fresh air. Children spend on average less than one hour per day outside. 52% of people in the U.S. are using houseplants to clean the air, according to market research. Since getting outdoors more often is not always an option, bring the outside in with houseplants. This trend is very active with millennials. Millennials are collecting houseplants more than ever and sharing photos of the “loves” on social media. Plants naturally “breathe in” carbon dioxide during the process of photosynthesis. As a result of this process, oxygen is released by the plants’ leaves. Plants also breathe in pollution in the air around them through microscopic openings in the leaves, and the toxins then move through the plant to the root zone. Room air is also drawn into the soil of a potted plant as the plant begins to dry. Microorganisms living around the roots “eat” any of these air-borne pollutants with which they come into contact, breaking down their chemical structures into molecules that can be taken up the plant as nutrients or that remain harmless in the soil. As a general rule of thumb, the larger the leaves, the more efficient the plant is at cleaning the air, but most plants are doing some good. Tests have shown that, while one plant is better at eliminating one chemical or another, an assortment of plants placed throughout an indoor space should make our homes and offices healthier. Potted plants are air purifiers that don’t require batteries or a filter change. As I mentioned earlier, February is Houseplant Month at the Great Big Greenhouse. Be sure to visit our website and review all that we are doing this month with houseplant promotions and sales. We hope to see you!! !